Gandhi’s advocacy of non-violence is closely connected to his attitude towards ends and means. He believed that violent methods for achieving a desired social result would inevitably result in an escalation of violence. The end achieved would always be contaminated by the methods used. He was influenced by Leo Tolstoy with whom he exchanged many letters, and he in turn influenced Martin Luther King and Nelson Mandela. When Gandhi became involved with the struggle for civil rights of the Indian minority in South Africa, his background as a lawyer once more helped him. This time his jury was public opinion in England. When Gandhi led the struggle for reform, he insisted that the means of protest used by his followers should be non-violent, even though violence was frequently used against them. In this way they won their case in the court of public opinion. Gandhi called this method of protest “satyagraha”, a Sanscrit word meaning “the power of truth”. In today’s struggles for justice and peace, the moral force of truth and nonviolence can win victories in the court of world public opinion. When praying at his ashram, Gandhi made a point of including prayers from many religions. One of the most serious problems that he had to face in his efforts to free India from British rule was disunity and distrust, even hate, between the Hindu and Muslim communities. Each community felt that with the British gone, they might face violence and repression from the other. Gandhi made every effort to bridge the differences and to create unity and harmony. His struggles with this problem are highly relevant to us today, when the world is split by religious and ethnic differences. Ruskin’s book, “Unto This Last”, which Gandhi read in 1904, is a criticism of modern industrial society. Ruskin believed that friendships and warm interpersonal relationships are a form of wealth that economists have failed to consider. He felt that warm human contacts are most easily achieved in small agricultural communities, and that therefore the modern tendency towards centralization and industrialization may be a step backward in terms of human happiness. While still in South Africa, Gandhi founded two religious Utopian communities based on the ideas of Tolstoy and Ruskin, Phoenix Farm (1904) and Tolstoy Farm (1910). Because of his growing fame as the leader of the Indian civil rights movement in South Africa, Gandhi was persuaded to return to India in 1914 and to take up the cause of Indian home rule. In order to reacquaint himself with conditions in India, he travelled tirelessly, now always going third class as a matter of principle. During the next few years, Gandhi worked to reshape the Congress Party into an organization which represented not only India’s Anglicized upper middle class but also the millions of uneducated villagers who were suffering under an almost intolerable burden of poverty and disease. In order to identify himself with the poorest of India’s people, Gandhi began to wear only a white loincloth made of rough homespun cotton. He traveled to the remotest villages, recruiting new members for the Congress Party, preaching non-violence and “firmness in the truth”, and becoming known for his voluntary poverty and humility. The villagers who flocked to see him began to call him “Mahatma” (Great Soul). 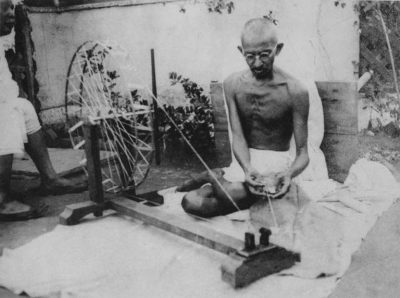 Disturbed by the spectacle of unemployment and poverty in the villages, Gandhi urged the people of India to stop buying imported goods, especially cloth, and to make their own. He advocated the reintroduction of the spinning wheel into village life, and he often spent some hours spinning himself. The spinning wheel became a symbol of the Indian independence movement, and was later incorporated into the Indian flag. 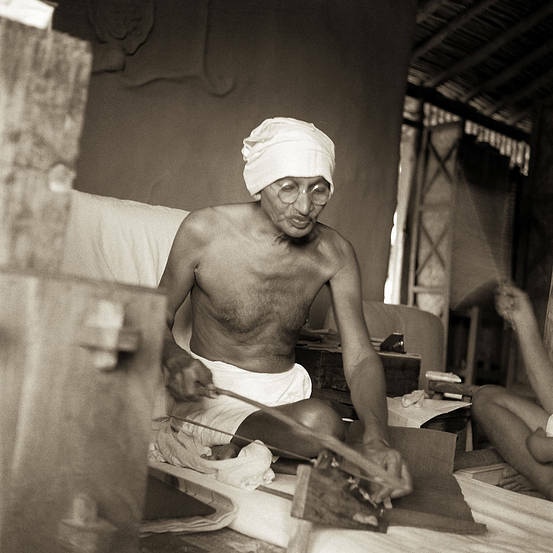 Gandhi tried to reconstruct the crafts and self-reliance of village life that he felt had been destroyed by the colonial system. In these passages we see Gandhi not merely as a pioneer of nonviolence; we see him also as an economist. Faced with misery and unemployment produced by machines, Gandhi tells us that social goals must take precedence over blind market mechanisms. If machines are causing unemployment, we can, if we wish, and use labor-intensive methods instead. With Gandhi, the free market is not sacred; we can do as we wish, and maximize human happiness, rather than maximizing production and profits. Mahatma Gandhi was assassinated by a Hindu extremist on January 30, 1948. After his death, someone collected and photographed all his worldly goods. These consisted of a pair of glasses, a pair of sandals, a pocket watch and a white homespun loincloth. Here, as in the Swadeshi movement, we see Gandhi as a pioneer of economics. He deliberately reduced his possessions to an absolute minimum in order to demonstrate that there is no connection between personal merit and material goods. Like Veblen, Mahatma Gandhi told us that we must stop using material goods as a means of social competition. We must start to judge people not by what they have, but by what they are. This article is a chapter of John Avery’s new book “We Need Their Voices Today”. Rest of the chapters can be read HERE.